This year I will not be a total sap and buy plants on impulse. You know how grocery stores place their magazines, jerky, candy, and gum so you pass them entering the checkout line? Nurseries pull the same trick, only with fuchsia baskets, ivy geraniums, and Gerbera daisies. Ooh, that’s colorful and cute, I want that. Except I have no good place to put it, so it stays in its plastic pot on my stoop for a month, requiring watering every day, until its roots grow into the concrete. Nor will I purchase or plant any required annuals until my watch, computer, and the front page of a reputable daily newspaper confirm it is indeed May 15th. When did I start shelling out money and potting up my containers last year? I tried to be good, and held off until the end of April. My reward? All my annuals just sat there, shocked and paralyzed by cool nights and cold soil. Some had to be yanked and replaced, while many that eventually lurched to life never hit full stride until August. If the rest of April and May remain cloudy and cool, I’ll wait even a week or two longer. If we get a solid warm-up end of April and early May, oh boy … I’m still waiting until May 15th. Speaking of pots and containers, I’ve concluded that, for my humble half-acre, owning a couple hundred is enough. I’m finished with buying a container simply because it’s the most gorgeous thing I’ve ever seen. So was the last one. Iron, granite, wood, plastic, concrete, clay, I own enough pots to decorate Loring Park. My wife asks, “Why did you buy that new pot when you have some in the basement you never use?” Well, honey, they’re down there because they’re not near as cool as this one. But this year, enough. I have enough pots. We all have enough to do this season without falling for any of the above. 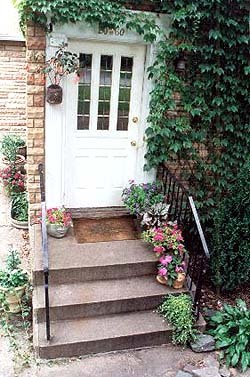 This spring I’m completely renovating my front yard, planting new trees, shrubs, altering and enlarging flower beds, adding stonework, seating, possibly a water feature, all-in-all considerably more than the whole nine yards. The design is finished, down on paper, a lot of work waiting to begin. Let it wait. April is our last month off, and I use it to sit inside, to relax, to ponder, my body resting, my mind reviewing, excited, certainly, but content for now to chew on more than I bite off. Last month I phoned the proprietors of some of my favorite local specialty nurseries to ask their thoughts concerning plant and design trends for the upcoming gardening season. We’re lucky in the Twin Cities to have a broad range of passionate, independent nursery people specializing in unusual plants you’ll not encounter at most big nursery centers (and will never find at any retailer selling plants and plywood). Over at Kelley & Kelley in Long Lake, third-generation nursery owner/landscaper Steve Kelley sees continuation of one trend toward plants, “That look native or are native. People are always looking for something distinctive, but with a more natural, relaxed form.” I couldn’t agree more. For decades, major nurseries have steered American gardeners toward use of perennials with origins in every corner of the globe except the United States. We’ve been hoodwinked into believing that duplicating some form of the classic English-style perennial border or cottage garden, with their reliance on plants native to Europe and Asia, is the only way to go. Just as punk rock was a return to roots, and a direct revolt against the over-produced, symphonic rock ‘n’ roll of the ’70s, so the use of native perennials (and shrubs and trees) by gardeners is a revolt born of the desire by some to recapture the botanical origins of our land. Kelley is high on natives such as big-and-bold Eupatorium (Joe-Pye Weed), shade-loving Cimicifuga (Bugbane), and dainty Gillenia, as well as ornamental grasses that may not be native, but look right at home. Ah, but remember … gardening is about nothing if not about individual taste, which explains why Ed Burke, owner of Phillip’s Garden in Minneapolis, notes increasing interest in the use of tropicals as a means of adding distinction to a Minnesota landscape. This is a one hundred and eighty degree shift away from the use of native plants, but that’s the great thing about creating a garden: whatever turns your crank. For lack of a better definition, tropicals are what we Minnesotans generally refer to as houseplants. “In our landscape designs, we’re including plants like Brugmansia, Phygelius, and Dracena to shake things up, unique specimen plants that serve as focal points,” says Burke. 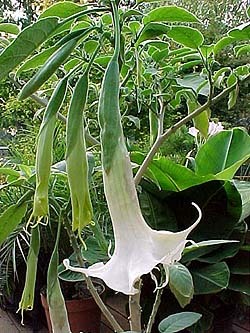 Focal points indeed-Brugmansia and Phygelius (Cape Fuchsia) are both exotic bloomers, while Dracenam (Corn Plant) is grown for its long, glossy, floppy leaves. Tropicals are not hardy, of course, and need be treated as annuals, purchased from the greenhouse as mature specimens, then planted no earlier than June, after the soil has warmed. Unusual annuals are fast becoming one of the hallmarks of Uncommon Gardens, a newer specialty nursery that popped up just two years ago in south Minneapolis. I asked owner Peggy Poore what’s hot on her list for 2003. “Funky sunflowers in unusual colors, and new pansy shades like copper, different blues, and outrageous reds,” she replied. “Gardeners are increasingly interested in adding the season-long color of annuals, but grow tired of the same plants every year.” Poore stocks her retail greenhouse with unique annuals grown at her request by a small, family owned Wisconsin nursery. High on her list this season are Salpiglossis (Painted Tongue), sporting two-inch, trumpet-shaped flowers heavily veined with accent colors; Linaria (Toadflax), a mid-sized, snapdragon-like tart offering upright, shimmering blooms in nearly every color, and Oxypetalum, a semi-vine great for pots and window boxes featuring sky-blue blooms that words do not well serve. Other outstanding specialty nurseries serving the Twin Cities include Landscape Alternatives, and Dale Street Greenhouse, both in St. Paul; Outback Nursery in Hastings; Ambergate Gardens in Chaska, and Rice Creek Gardens in Blaine. Experts at each will no doubt offer additional topics, twists, and trends to explore in your garden this summer.